We set off yesterday for a drive along the Blue Ridge Mountain’s Skyland Drive in Virginia. The lush autumn day left only a slight haze over the distant mountain ridges above the tidy valleys dotted with farms and villages. Easy to see why they’re called the Blue Ridge Mountains. I noticed signs along the roadway commemorating the work of the engineers and laborers who carved these crazy, curving roadways and paths out the mountains’ faces and through the deep forests. The construction of the Skyland Drive and the Blue Ridge Parkway began in 1931, two years into the Great Depression, as part of President Franklin D. Roosevelt‘s WPA “Back to Work” national program. 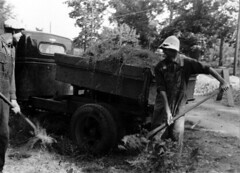 WPA workers shoveling plant material. How fortunate we are that this beautiful area was preserved for us to enjoy – the roads clinging to the mountains, stone bridges and low walls holding back the forest – our legacy from the hardworking laborers of that terrible time. Our recent election with its broad and deep voting base showed me that we are once again shouldering our responsibilities – “Let’s get to work.” Like the men and women who survived the Great Depression of 1929, we too will make the best of a bad situation – the Great Recession of 2008. We too will find ways to protect and enrich our planet and our nation, to leave a legacy of strength and beauty for future generations to cherish and admire. This entry was posted in Life Lessons, Nature and tagged Blue Ridge Parkway, Franklin D. Roosevelt, Great Depression. Bookmark the permalink. 6 Responses to The Sky’s the Limit! Lovely reminder about what counts. Nature’s beauty around us & her beautiful creatures. Thank you for your delightful posting! I agree!! We can do this again. Great article. First image of the photo t was a brief resemblance to the Great Wall of China which I didn’t built. Nor did I build Skyline Drive. Clearly this latest of your delightful writings is merely a thinly disguised editorial message. Nevertheless, your attempt to veil your gloating over Barack Obama’s election is now revealed. I agree wholeheartedly. We must seek our better angels and hear their counsel. Lovely. I’ll share with Mari– a reminder of our skyline drive trip.